My wife had me bring in the Christmas Tree from the outside storage, so she could decorate and get us in the Christmas spirit. I told her we should just put our gifts around nature's Christmas tree in the garden, ready made with red and green ornaments. Last edited by lakngulf on Sun Dec 05, 2010 10:00 pm, edited 1 time in total. Beautiful ! Merry Christmas ! all you need is some lights now. That is a beautiful little Christmas Tree! I've never seem them loaded with red peppers like that! Make a little hole and push little clear lights in each pepper. You can have them light up and dry them at the same time! That is one spicy Christmas tree! My wife got me a set of Christmas lights that a chillys and it looks just like your chillys. I google maped the lake your on; it looks like a fantastic place and a good water ski lake. tomf wrote: That is one spicy Christmas tree! My wife got me a set of Christmas lights that a chillys and it looks just like your chillys. Wow, that's great! A jalapeno, is it not? How old is that plant? I always try to get red jalapenos, but they always start getting woody so I pick them. Maybe I should just leave them alone next year and see what happens. Great tree, none the less. garden5 wrote: Wow, that's great! A jalapeno, is it not? Yes, it is a jalapeno. I started seed indoors late January or early February. Not positive when they were transplanted to this spot, but they are in great "natural" compost from a pasture from the farm where I grew up. They survived some pretty hot sun this summer, but were growing in among some healthy tomato plants that probably gave some shade during those hot months. I have another plant close by that has that "woody" look that you mention. I really just grow jalapenos for looks and use only a few, so I tend to leave them alone. Oh you HAVE to try making the Hot Pepper Jelly that Lindsay Arthur posted in the Recipes Forum!!! It's wonderful! There's a lot of sugar in it so it's actually sweet -- it's not spicy except for a mild warmth that spreads on your tongue after you swallow. I like it on buttered toast. 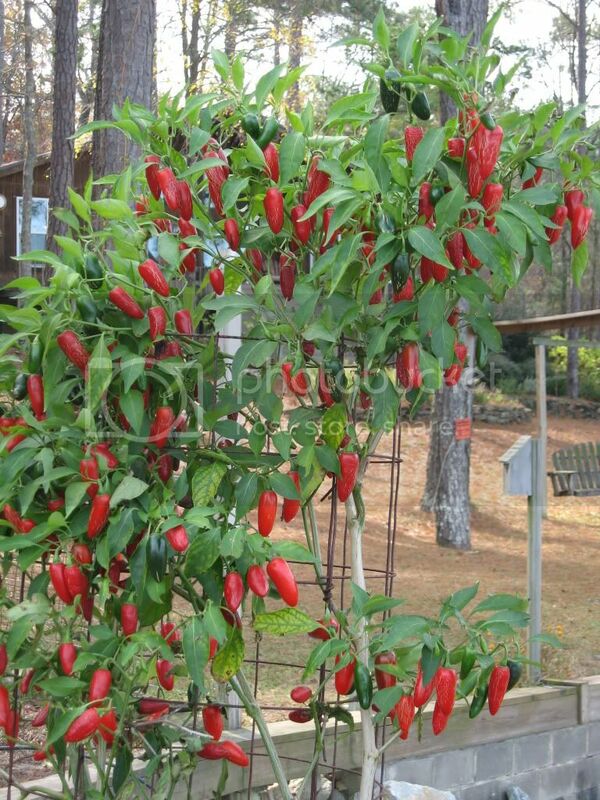 Beautiful Pepper plant and Peppers ... great job !!! Ugh, this makes me so jealous of you southern climate people that can keep your peppers going! 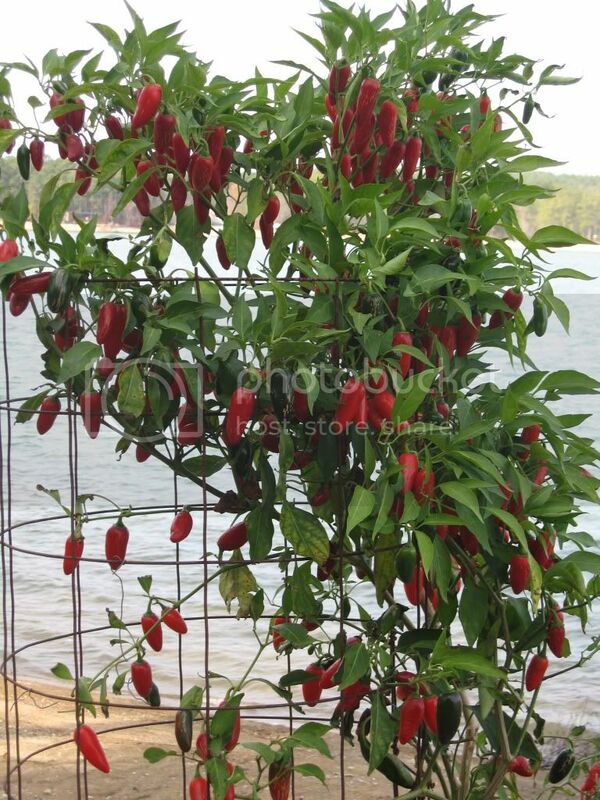 I'd kill to get a pepper plant looking like that! However, I am glad for my winter slump. Gives me a chance to catch up, slow down, and enjoy eating my yummy garden salsa while watching the snow get deeper outside. mansgirl wrote: Ugh, this makes me so jealous of you southern climate people that can keep your peppers going! I took these pictures last Sunday. That same day I picked some green and red bell pepper to put in some venison chili. Also, added fresh onion and tomatoes that I had frozen this summer. Very GOOD!!! Last night, however, we had 22 degrees here in central Alabama...Very COLD to us. I am sure that was the end of the peppers. My wife did put lots of bell pepper in the freezer and we have lots of tomatoes, along with tomatoes and okra for winter soup. From all I've heard, the secret to getting red jalapenos is.......there is no secret. I just pick them too soon, I think. Next year, I want to set aside a plant that I will not pick any from and see just what happens. They will probably start getting woody, but them maybe they will turn red. Do the red taste any different? It's pretty impressive you got the plant that big from growing it only in a pot! How big is the pot? Apps, that sounds good. I should really visit the recipe forum more often. HG mentioned that his peppers start to get woody in fungal soil in the Teaming with Microbes Ch. 1 Book Club Forum thread. I saw that, Apps, and it did get me thinking. However, I don't think that an abundance of fungi was the case since I has just disked the grass off of the area and the same thing happened the year before in a different spot. I think it's just the natural progression of the peppers. Something good to keep in mind, though.